Feel Bach! flower remedies blog: And he said "It's not my fault!" And he said "It's not my fault!" When my kids were young they had one friend who always said “It’s not my fault” or “I didn’t do it,” even when no one was asking. He just assumed that if I said something like “It’s time to pick up these toys” that I was accusing someone of leaving them where they didn’t belong, or of not picking them up on time. That child was a trial to be around. Unfortunately, many adults play the same “blame game.” And worse, they believe it. They feel like they’re victims, being misjudged and blamed unfairly. Everyone can get into this negative Willow state from time to time, but for some it’s chronic. I often wonder if that little boy my kids played with has kept that attitude into adulthood. When the negative Willow state becomes chronic, it can spoil not only the sufferers life, but impact the lives of everyone around him or her. In this state, people are demanding of others, but never appreciative. Nothing is ever “good enough” to please them. Chronic Willow victims seldom succeed at what they do, and always point outside of themselves for the reason why. In their own minds, they are victims. 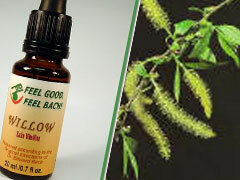 Using the Bach Flower Essence Willow can turn this around, although it may take lengthy treatment. This is not only a disconnect between the personality and the Higher Self, but an ingrained habit that must be broken. The first step is for the sufferer (for they ARE suffering!) to recognize his or her own bitterness and negativity – and then to want freedom from it. To learn more about the Willow personality and how Bach Flower Essences can help, visit BachFlower.org. And, if you aren’t sure which of the Bach Flower Remedies would be most beneficial to you, come to Feel Bach! and take our questionnaire.